It’s finally here. Diesel’s brand new album AMERICANA is out today. It’s his 15th career album, and as an artist born in America and raised in Australia, a link back to the land he’d left behind. Americana is the music of his childhood and draws from America’s roots, from country, folk, bluegrass, R&B, the blues. On this new album, Diesel pays tribute to the artists that inspired the musician he would become. ‘Ring Of Fire’ by Johnny Cash; ‘Rave On’ by Buddy Holly; ‘Born To Run’ by Bruce Springsteen & The E Street Band; ‘Circle Game’ by Joni Mitchell; ‘Here Comes My Girl’ by Tom Petty and the Heartbreakers; ‘Queen Jane Approximately’ by Bob Dylan; ‘Angel From Montgomery’ by Bonnie Raitt; ‘Fire And Rain’ by James Taylor; ‘Born On The Bayou’ by Creedence Clearwater Revival; ‘Don’t Let It Bring You’ Neil Young & Crazy Horse; ‘Rag Mama Rag’ by The Band and ‘Scarlett Ribbons’ by Jo Stafford. Each song a veritable classic and each requiring the care and attention so as not to tread on the toes of musical history but equally to add Diesel’s own new spin and interpretation. To coincide with the release of Americana, Diesel will be embarking on a national Australian tour from September 2016 with his band who helped him bring these classic songs to life on record. Other shows will see Diesel play in solo mode giving fans the opportunity to hear the tracks raw the way he first approached them. 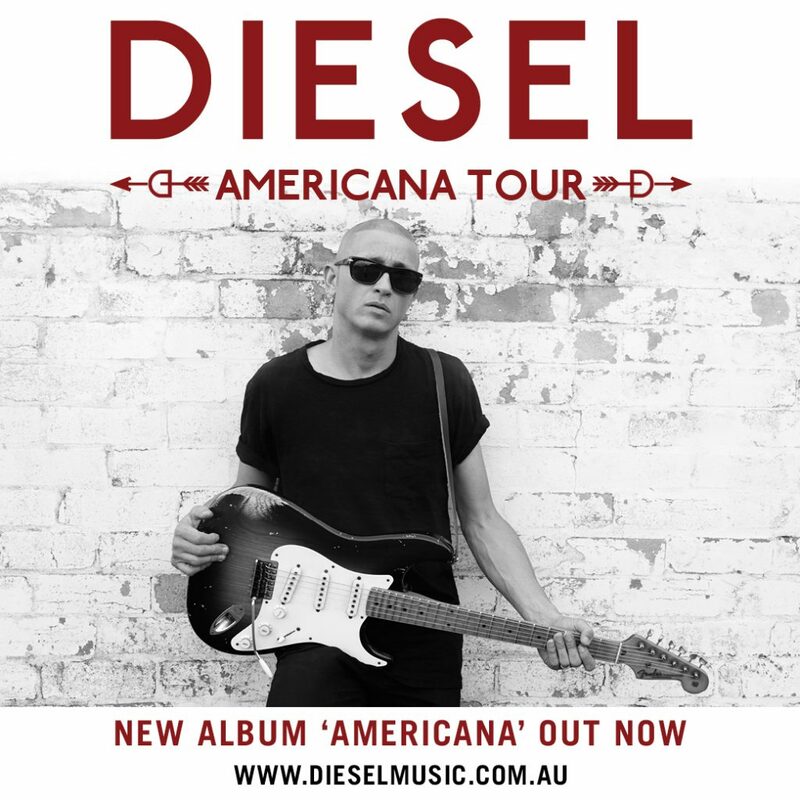 Don’t miss Diesel LIVE as he circles the country on his ‘Americana’ National Tour. We’ll see you there! Love to see you in Tassie Diesel! Come on add us to the tour!! !